Beautiful villa, the views we're breath taking and our host was gracious and very attentive! We had a really good time, would love to go back. Unique amazing location on the rocks, just on the outskirts of Chania, in a great neighbourhood. Spacious, luxurious, private. Little details like toiletries, welcome gift from Nick, kitchen with all the mod cons. All the small things thought of. Will return! What an incredible place. We loved everything about it. Nick was an amazing host . Awesome view and neighborhood, apartment is located near the city centre which brings a lot of opportunities. The Owner is a great host, he helped us a lot! I can recommend this place for everyone who wants to spend a great time on Crete. 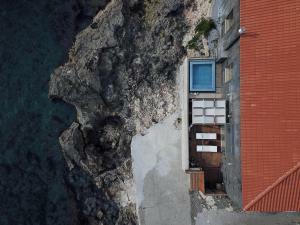 The villa is located just by the sea guaranteeing excellent views. We enjoyed the industrial design of the house. The living area is very spacious. 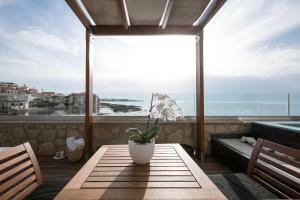 Both terraces are large and nicely furnished. There is an excellent restaurant very close to the house! Stayed there only for couple of days but we are coming back in Oct! The location is unique, just by the sea, rocky but swimmable! Cute plunge pool with breathtaking view, restaurants and shops nearby! Spacious indoor and outdoor areas, fully equipped, also great service, It is by far the TOP villa in the city. Great hosts, luxurious amenities, stunning view of the sun setting beyond the sea. A truly memorable experience. Tout: le lieu tranquille, la beauté de la villa, la vue sur mer des deux terrasses de la Villa, notre hôte Nikos, tout le matériel pour la plage, la cuisine....même un petit déjeuner prévu par notre hôte car nous arrivions tard au soir. Bref...que du bonheur! De magnifiques couchers de soleil que l'on peut admirer confortablement depuis la terrasse. Nous avons adorés les petites attentions des hôtes. 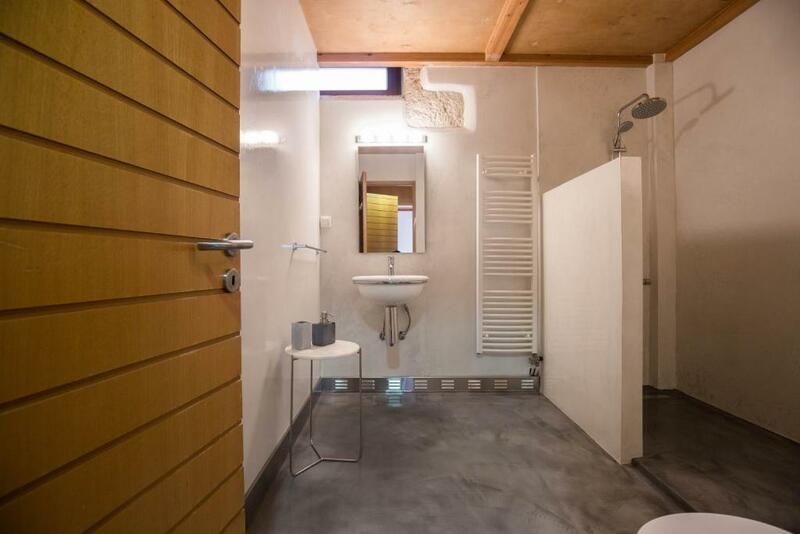 Une villa bien agencée, bien équipée et très propre. L'emplacement est idéal. Un séjour fantastique! Lock in a great price for Villa Yasemi – rated 9.7 by recent guests! One of our best sellers in Chania! Perched on the edge of a cliff, Villa Yasemi is a 19th century tannery, turned into a self-catering villa. 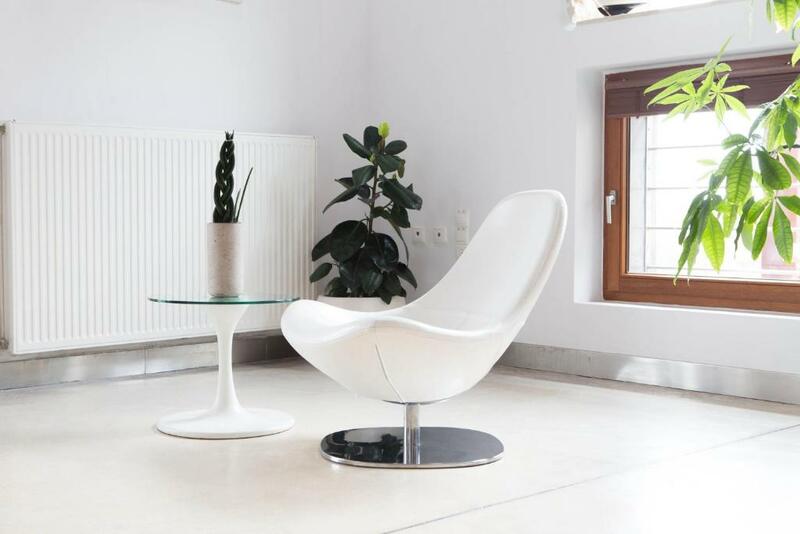 This modernly designed property offers a combination of simple, elegant design and unobstructed views of the sea. Industrial period details and 21st century technology stand side by side in the villas sunlit rooms. A cozy library and an eclectic lounge are featured. Free air-conditioning and WiFi access are available at the property. The open-plan main living spaces include a living and dining area along with a kitchen. The master bedroom with its private bathroom is adjacent to the kitchen. An indoor staircase leads to an open-plan loft consisting of two bedrooms with sea view from the internal balcony. Windows run the length of the house, brightening the space with natural light. It has 2 spacious furnished decks,one of which has an infinity plunge pool, while the other has an outdoor dinning table under a shaded pergola. The property is 500 feet from House-Museum of Eleftherios Venizelos and 1 mi from fountains and traditionally built churches, narrow shopping streets,cafes and restaurants. If you feel like visiting the surroundings, check out Municipal Market of Chania and Chania Old Venetian Harbor at 1.2 mi. Souda Airport is located 5.6 mi away. When would you like to stay at Villa Yasemi? This villa has a private entrance and opens to 2 spacious decked terraces, one of which comes with an infinity plunge pool and unobstructed views over the old Venetian Harbor. Chania town is 1.6 mi from Villa Yasemi. Welcome to Villa Yasemi a property with unique architectural design located in Chania, Crete. 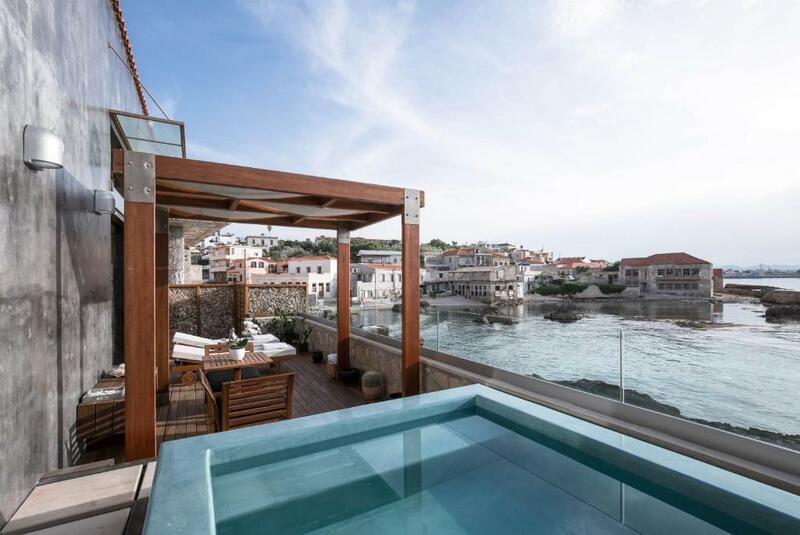 The private villa is lapped by the waters of the sea and has an unlimited view of the Cretan Pelagos. Is on quiet calm place for enjoyable holidays with discreet luxury, offering relaxing spaces to enjoy the enchanting colours of the sea. 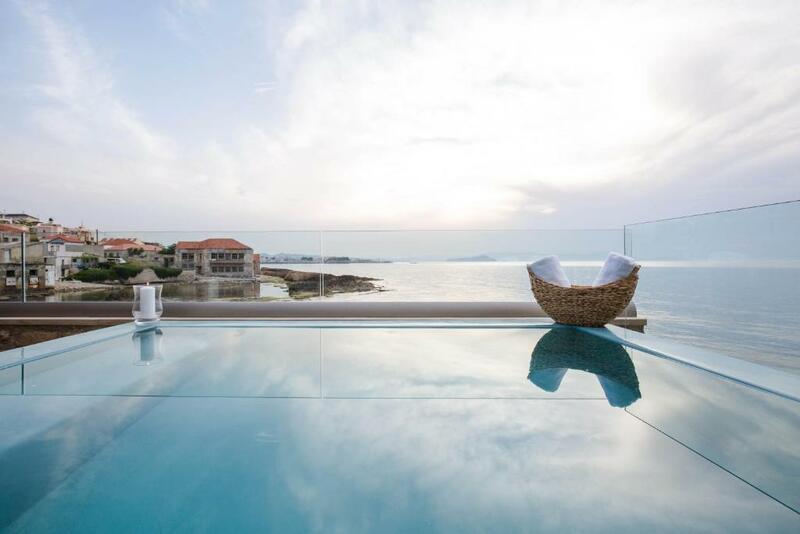 To find us close to the city of chania in the coastal region "Tabakaria", the ideal atmosphere to spend your vacation "a dream home away from home". Hello , my name is George and I am managing Villa Yasemi , providing high quality services, ensuring that we listen to your individual needs and are always here to anwer any concerns you have. 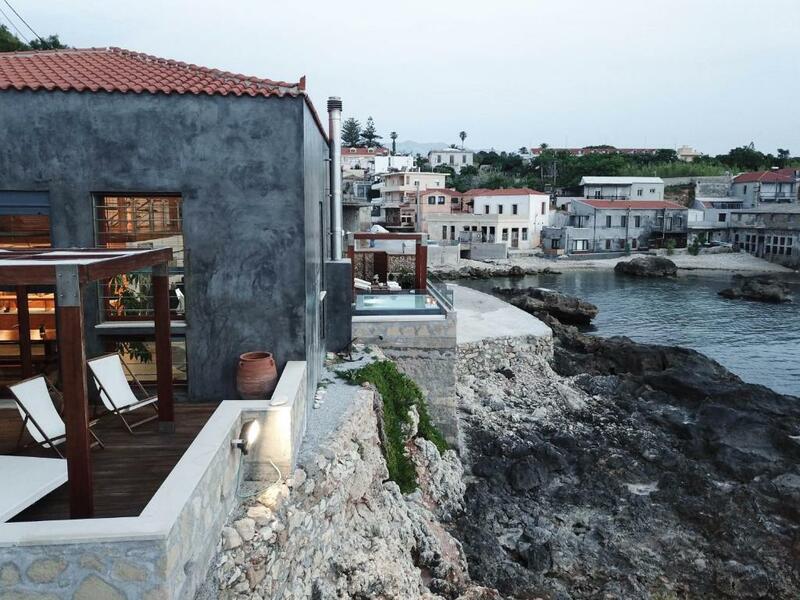 "a sort story about me"
Villa Yasemi lies on the rocky eastern region of Chania-Crete one mile outside of the grafical Venetian port in the area "Tabakaria". There were since the early 19th century the old Tanneries for processing leather located. (extends from the coastal part of Vivilaki street to the east area of Agia Kyriaki). It is a very atmospheric region, an architectural monument of the industrial age and part of the history of chania. The surrouding area is ideal for walks and to explore the tanneries and see in action the workers, is quite an experience. Within easy walking distance on the hillside "Halepa" showing prosperous life as it was in 19th century, with the neoclassical mansions of the historical personalities of Crete, near by the villa can visit the museum of Eleftherios Venizelos and the garden with one beautiful Russian Church. In Chania you have interesting things to do and places to visit: museums, Venetian port speaks for it self, the old market and a lot of sandy beaches, traditional villages, natural monuments, gorges... Villa is close to local shops and greengrocer's, 20 min by the car from both Port of Souda and Chania Airport. Taxis are daily available. 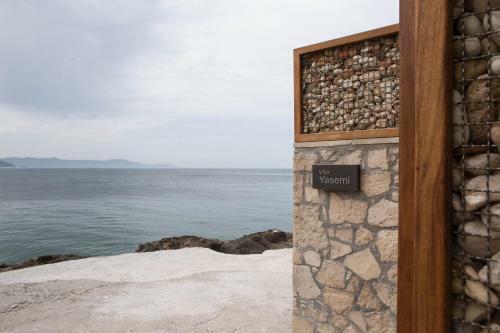 House Rules Villa Yasemi takes special requests – add in the next step! Villa Yasemi accepts these cards and reserves the right to temporarily hold an amount prior to arrival. Please inform Villa Yasemi of your expected arrival time in advance. You can use the Special Requests box when booking, or contact the property directly using the contact details in your confirmation. Everything was great, nothing bad to say at all! Pool was cold in early October. Would be good if heated. The pool is more like a cold jacuzzi. Judging by the photos we expected it to be larger. The bedrooms are on the smaller side.